The Win Wizard slot machine offers you winnings up to 10,000 times your bet on the reels and a very generous bonus feature that can pay you up to 500 times your total bet. You can bet on 20 paylines over 5 reels is this highly entertaining slot machine from Astra Games. 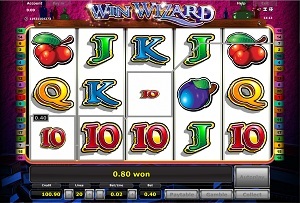 Graphics & Appearance: The Win Wizard slot machine is a delightful composition of nice design, colours and fun sound effect. The game window is designed in a deep purple colour and it makes the reels and its symbols very clear. The designs of the symbols are very sharp and edgy. The sound effect that starts once you have hit a spin has the same sound as the old cash machines. Gamble Feature: As soon as you have managed to win on the reels you will be presented with the option to gamble the spin win. This is a chance to double your win but also a risk to lose it. To start the gamble feature you simply click on the Gamble button which is located in the bottom right corner. This will take you to a new window where you have a 50/50 chance to win. If you win, you will be able to gamble again and win even more or to collect and return to the reels. Game Symbols: The Wild symbols is a toad with a crown and will appear on the third to fifth reel as any other symbol and counts as any other symbol. The highest paying symbol is the Magic Ball and will pay out 10,000 times your stake if you are lucky enough to land this symbol on every reel position. The lower paying symbols are cherries, plumbs, 10, Jack, Queen and King. Bonus Feature: Win Wizard has an interesting Bonus feature called the Win Wizard feature. In this feature, you win a lot of twists. The "Win Wizard" feature is started by chance at the end of a run. There may appear up to five Win Wizards on the rolls and pay out more profits. This feature will pay between 5 and 500 times the bet. Betting Options: This slot machine has twenty paylines over five reels. If you wish to alter your stake preference, this is easily done by using the + and – buttons that are located in the lower part of the game window. You may also be able to view the paytable and be able to see how much each of the symbols pays. Game Features: The Win Wizard slot has an Autoplay function available and this is a function which is very comfortable to use because you will not have to click on the Start button to get every spin spinning. Simply, click on the Autoplay button to start and stop this function. You should be aware of that you will not be able to access the Gamble feature while you are using the Autoplay function. The Bonus feature will pause the Autoplay function. « More slotmachines guides Article last updated: Thursday, June 02, 2011.